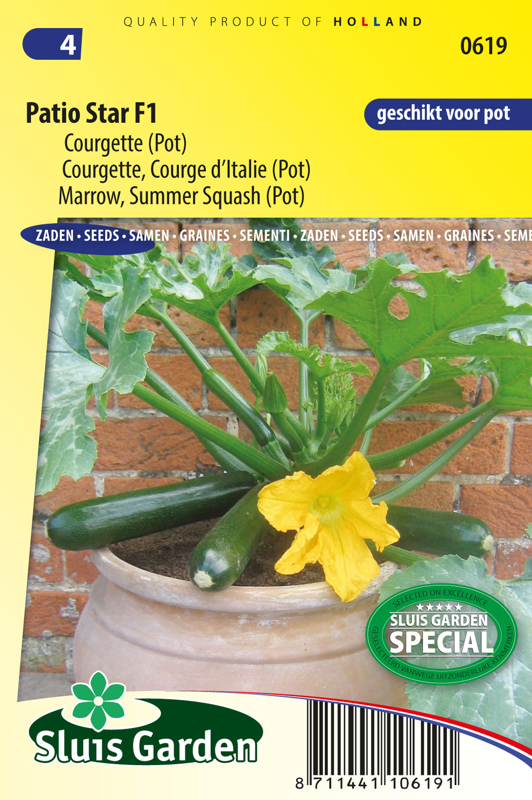 Patio Star F1 is a splendid courgette for cultivation in large pots. 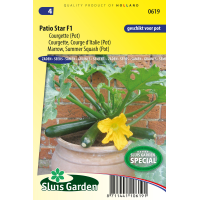 Ideal for growing on a balcony or small garden. The plant grows to ± 45 cm tall, ± 60 cm wide and forms very tasty small fruits. Has fine resistance properties. A healthy plant with attractive dark green fruit. Harvest the fruits young! It is a thermophilic crop, therefore preferably pre-sow in a greenhouse in pots. Requires fertile, highly humid soil. The leaves with silvercoloured blotches do not indicate disease, but are a hereditary feature. The flowers are edible at an early stage.